Autumn, also known as fall in North American English, is one of the four temperate seasons. Autumn marks the transition from summer to winter, in September (Northern Hemisphere) or March (Southern Hemisphere), when the duration of daylight becomes noticeably shorter and the temperature cools down considerably. One of its main features is the shedding of leaves from deciduous trees. Some cultures regard the autumnal equinox as "mid-autumn", while others with a longer temperature lag treat it as the start of autumn. Meteorologists and most of the temperate countries in the southern hemisphere use a definition based on Gregorian calendar months, with autumn being September, October, and November in the northern hemisphere, and March, April, and May in the southern hemisphere. wiki In North America, traditionally autumn starts September 21 and ends December 21st. 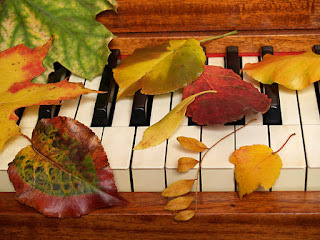 Listen for our music of autumn from beautifulinstrumentals.com along with our regular playlist.